Building blocks, while still a fairly simple toy, remain one of the most important valuable learning experiences for young children. Whether they’re stacking them or creating more complex structures, children are (unknowingly) learning in all areas of development, including intellectual, physical, and social-emotional and language. In a world that’s becoming increasingly complex, where success is driven not only by what you know, but by what you can do with that information, it’s more important than ever for our youth to be equipped with the knowledge and skills to solve tough problems, gather and evaluate evidence, and make sense of information. Around the world educators are encouraging students to study science, technology, engineering, and math—subjects known as STEM. And believe it or not, blocks help children nurture and develop skills in each of these disciplines. Those building blocks, a staple in every playroom, are literally building a solid foundation for our little ones. So next time you stand on one of those odd-shaped yet strangely always sharp-edged pieces in the middle of the night, you can ease the pain knowing you’re giving your child the very best start in life. I’ve been around the block (oh no I didn’t!) a few too many times to be impressed by products claiming to have won awards. For me, the proof is in the pudding and so to see if I would give these Stick N Stack tiles my seal of approval, I got a set for my little boy. And the verdict is they are awesome! The 120 piece set includes 4 round doors, 4 double doors, 8 windows, 16 gates, 8 Porch pieces, 2 car bases, 2 train connectors, 8 6×3” large tiles, 32 3×3” squares, 12 long triangles, 16 small triangles and 8 wide triangles. There is no limit to what can be built, allowing your child, and in my case, my husband, to unleash their creativity. They’re also compatible with other brands of magnetic tiles, which is a huge win. I love that these rather unconventional building blocks are meant to topple over. Tobbles Neo can be stacked straight up or at angles to create a wobbly tower. For little ones, too small to stack, they’re easy to grip, comfortable to hold and even seem to soothe sore gums (of babies I know, not mine). 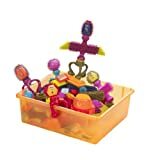 There are no rules when it comes to Tobbles and unlike other games where blocks falling means you’ve lost, these brightly colored spheres are meant to tipple and topple, encouraging play and exploration. 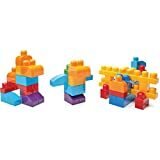 The gateway to more serious building blocks, Mega Bloks are made for little hands and designed with toddlers in mind. They’re easy to hold, stack and take apart and offer endless learning (and building) opportunities. Children learn about primary colors, spatial planning, counting, fine and gross motor skills and hand and eye coordination. These get a thumbs up from me based on looks alone. They are seriously the most beautiful building blocks I have ever seen. The wooden blocks from HABA are made with PEFC certified beechwood timbers, which means more trees are planted than harvested and a safe water-based non-toxic stain is used to give the blocks their gorgeous colors. There are 16 blocks in this set, including special blocks with a rattle, bell, mirror, and prism, perfect for developing coordination and motor skills. Let me tell you if my Ben saw these he would think he’s died and gone to building blocks (and bricks) heaven. 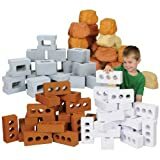 As an enthusiastic four-year-old with a zest for life, he wants more than anything to be a builder when he’s big, and I know these would be well loved and played with. In fact, I don’t know of too many children who wouldn’t love this collection of realistic pretend bricks, blocks and rocks. Spinaroos are made with small hands in mind and because they’re easy to put together and pull apart, little ones love them as much as older, more accomplished builders. Two twisty bases bend and mold into the shape your child wants and one spin base spins 360º with the characters on top. Four character faces and a building ideas booklet is included, although I don’t think you’ll need help with ideas. Spinaroos will keep your children, and you, entertained for hours, and they come with a re-usable storage bin for easy cleanup. 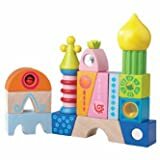 I’m always on the lookout for building blocks that will stimulate and hold my daughter’s attention, and up until recently I hadn’t found anything suitable. But Roominate Chateau has changed all of that. Not only can girls (and boys) design and build their own two-level structures, electrical circuits bring the creations to life, with spinning windmills, lamps, elevators and a whole lot more. This 131 piece set teaches important STEM skills including hands-on problem solving, spatial and fine motor skills, self-confidence and creativity. These Reptangles building blocks are definitely for slightly older kids. I made the mistake of buying them for my four-year-old nephew, and the result was a frustrated tear stained little boy and a very embarrassed aunt. The turtles literally snap and slide together in over 100 geometric ways, teaching important math concepts while broadening and deepening spatial thinking skills. Older kids (and adults) love them. Do these look familiar? TINKERTOY was created in 1913 after inventor Charles Pajeau watched children playing with pencils and empty spools of thread. It’s a classic toy that brings the whole family together. Recently named one of the top retro toys, the new and improved pieces snap together easily and stay together. 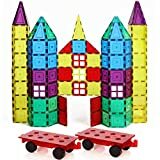 Having celebrated its 100th anniversary in 2013, this building set encourages creative play and helps develop fine motor and problem-solving skills. These are definitely not your traditional building blocks, but let’s face it, we live in a technological world and in order for us to ‘future-proof’ our children and prepare them for careers we haven’t even thought of. This award-winning wacky wigglers set features 130 motorized pieces with colorful gears, springs, chomping teeth, flashing lights, whiskers and glow-in-the-dark eyeballs for endless creative combinations.and includes instructions to create four awesomely fun creatures. Feature image courtesy of Flickr, SocialAlex.